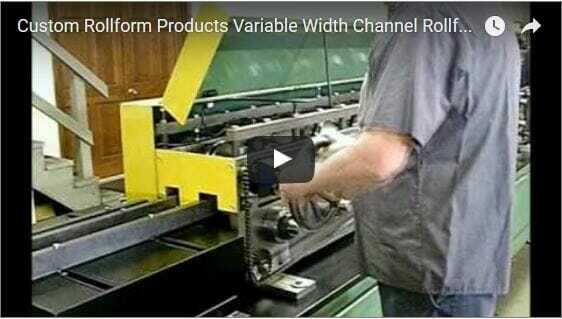 Custom Rollform Products Videos on YouTube! 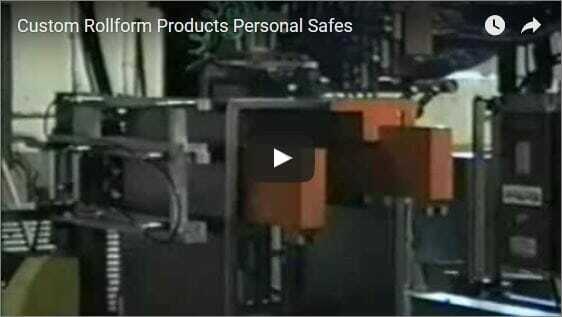 The complete coil fed, punch, notch, rollform and endform system consist of a Dual Mandrel Decoiler, Powered Feeder Straightener with Sonic Loop Control, a series of pre-tooled Hydraulic Punch, Notch Dies with a Programmable Rollfeed, a special pre-tooled 24 station Rollformer and two complete sets of Cutoff and Endform Presses. This system was designed to form 1/2″ flanges on both ends of the pre-welded galvanized and stainless steel Flue Pipe. 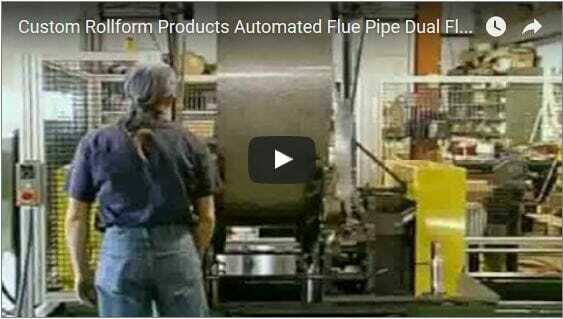 The Automated Dual Flanging Heads form up to 18 gauge in diameters from 6″ to 48″ and in lengths ranging from 12″ to 60″ long. Length changeovers are accomplished in less than one minute. This is a coil feed, notching, punching, rollforming and tangent form application integrated into a complete automation system. 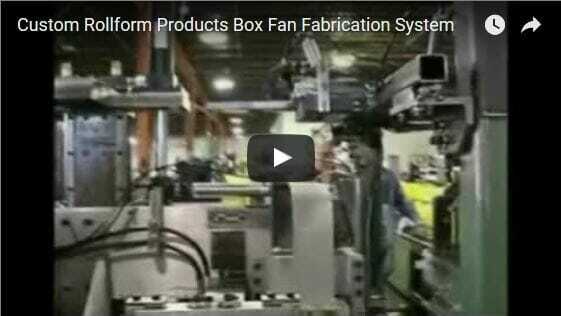 This system consists of two (2) Rollform Systems to simultaneously manufacture the two (2) Fan components required for this Box Fan Application. As the parts are fabricated they are fed directly into a series of forming and assembly operations to toggle lock the housing together, insert the motor mount struts, then clinch lock the struts into the Fan Housing. The compact design and heavy duty construction makes this our most popular system. The Programmable Feed handles materials 26 to 10 gauge, up to 72″ wide. Our wide range of Drives, Controls, and Applications assures you will get the dependability and accuracy you expect from a quality system. The Compact Coil Line System features our quality Feeder Straightener & Shear Cutoff combined on a heavy duty all welded steel frame. We offer a wide range of Programmable Feed Drives & Controls for both Flying & Index Feed Applications. 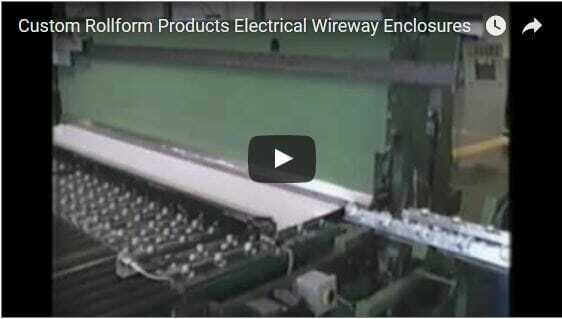 The E-Stud Line is compact and designed for the light commercial industry. Its unitized construction allows it to be taken to the job site, relocated within the plant where needed or easily stored between jobs or applications. This is not a light duty, chain drive, portable, job site throw away. 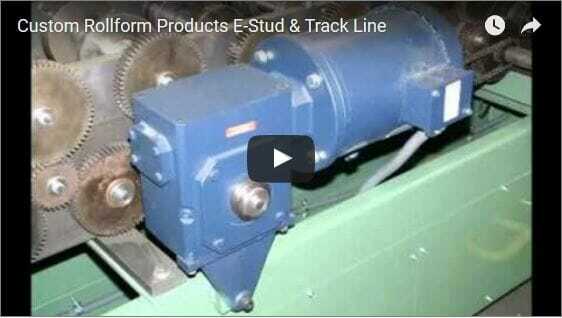 The E-Stud eliminates extensive coil changeovers and roll spacer tooling setups. Once you understand all the features the E-Stud provides, nothing else will compare in price, for years of dependable service. 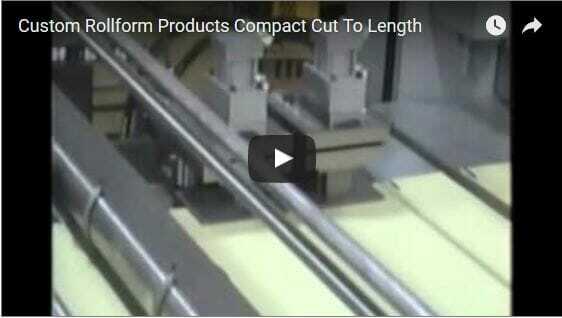 Our Variable Width Rollform design positions the roll tooling with a simple leadscrew handwheel. The variable tooling design allows the operator to make width changeovers in less than a minute. 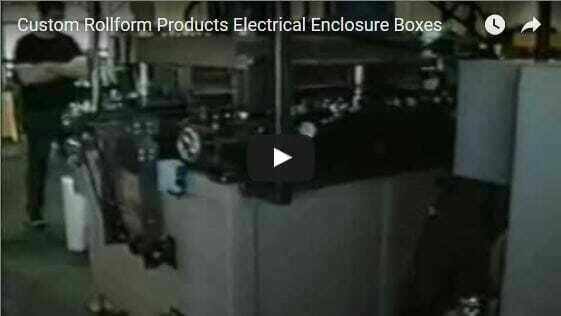 All E-Stud Lines feature quality Punch and Cutoff Dies, All Gear Drives, Heavy Duty Spindles and Bearing, and Full Hardened Rolls to assure years of maintenance free service. Two profiles pre-tooled side by side for a quick changeover. 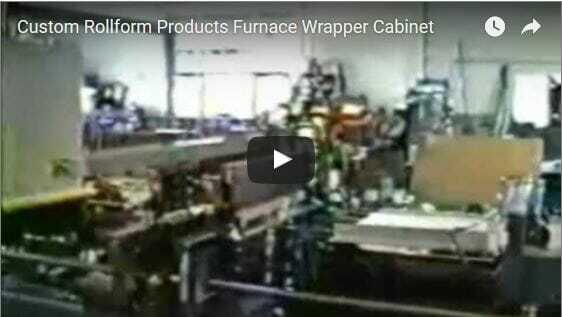 Three sided frame with mating end frame sections are produced on the same coil feed, notch, punch rollform line. 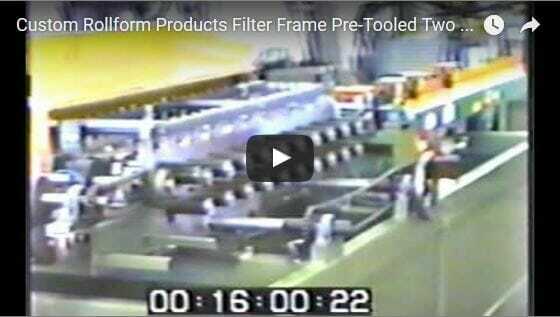 This system produces a wide variety of Full Wrapper Filter Frames. 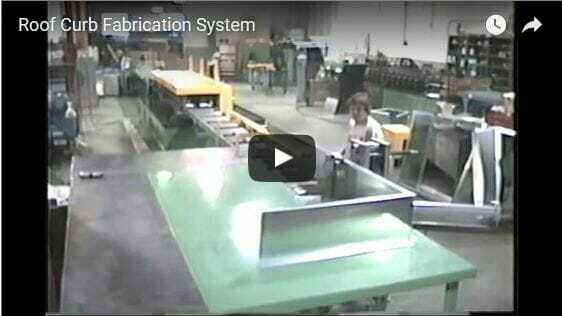 We build systems to increase productivity, minimize inventory and handling. 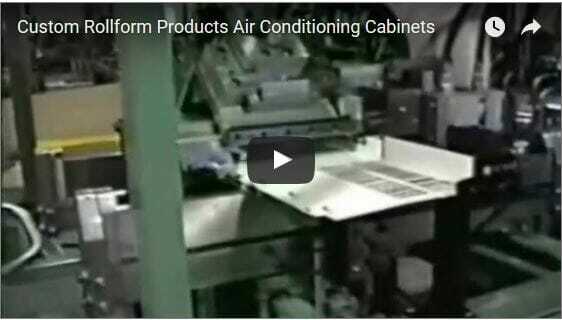 Systems are tailored to eliminate or minimize changeover of setup time. These are quality systems at a price you can afford. 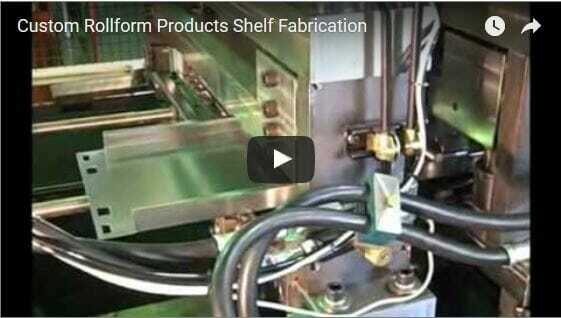 Coil Strip Feed and Rollform System designed and built by Custom Rollform Products, Inc. 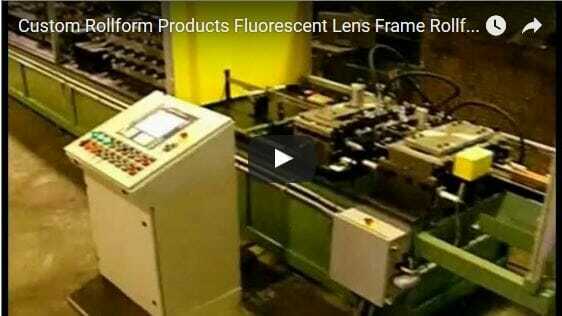 The Automated System is designed to form 2′ x 2′ and 2′ x 4′ Fluorescent Light Fixture Lens Frames directly from steel coil strip stock. The System consists of a pallet style Uncoiler, several Punch, Notch, Emboss, Cutoff Press/Dies, and pre-tooled Rollformer. 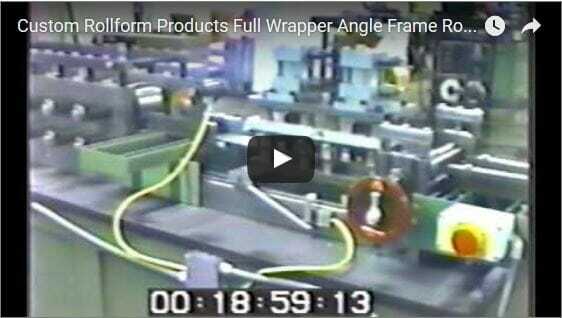 Programmable Feed produces Frames 4″ x 4″ to 48″ x 72″ in any combination with no scrap loss. Eliminates setup and changeovers. 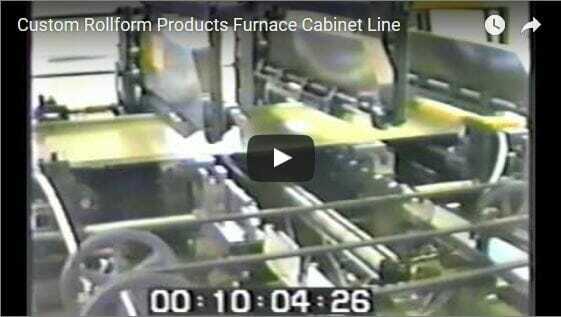 Starting from Pre-Punched and Notch Blanks, we developed an On-Time Production Cell to feed and form the Pre-Painted Cabinet Shells directly onto the Infeed Conveyor. 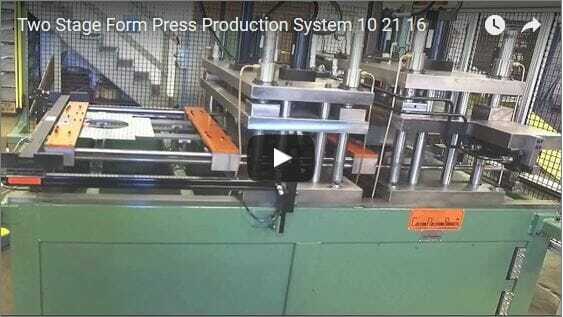 Utilizing a Destack and Feed Rollformer and Four Ram Tangent Endformer, the blanks are fed and formed and staged to operate as a Just-In-Time Part Call-Up System. This system produced full wrapped four (4) sided Housing ranging from 24″ x 24″ to 36″ x 72″ in three (3) depths (strip widths). 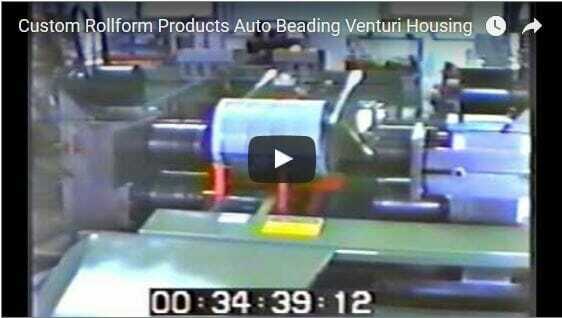 The coil feed, notched, punched, rollformed, and tangent formed Housings are complete and automatic. 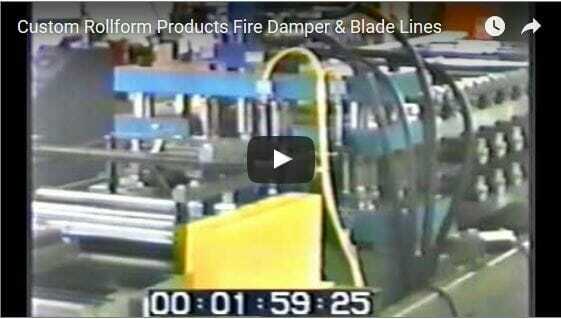 The front flange (4″ with a 2″ return) was rollformed simultaneously with the 1-1/2″ back flange. The H.D. 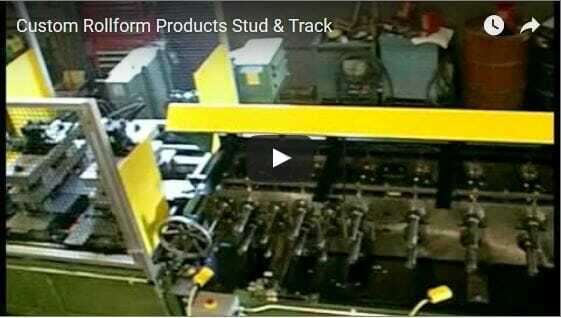 Stud Line was developed by Custom Rollform Products as an Economical System to manufacture Stud and Track on a just-in-time basis. It offers the latest concepts in quick-change setups that allow you to convert from Stud to Track in less than a minute. 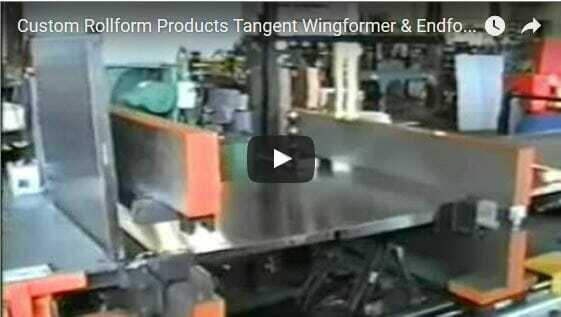 This allows manufacturers of Pre-fabricated Housings and Major Contractors to produce cut-to-length sections on-time and as needed without hours of setups, coil changes and excessive scrap loss. 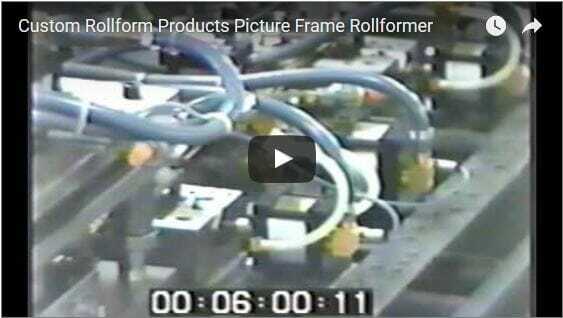 Rollformer produces a wide variety of Metal Picture Frames from high polished laminated coil strip. System embosses the strip & rollforms the Frames. 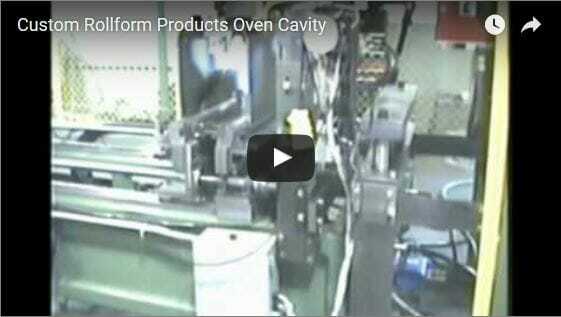 Notch, Cope & Cutoff Dies produce frames 2″ x 3-1/2″ to 11″ x 17″ at up to 40 per minute. Three (3) frame profiles pre-tooled for a quick changeover. 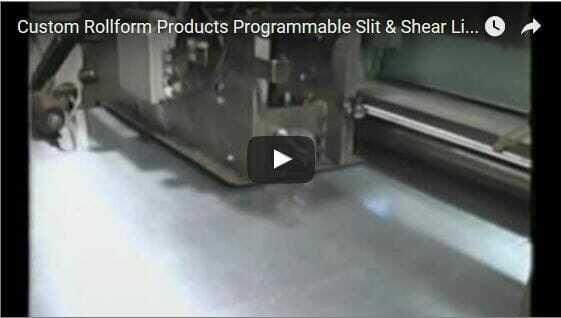 Automatic programmable Slit and Shear Line. 60″ wide 14 GA. with two (2) Programmable Shears. 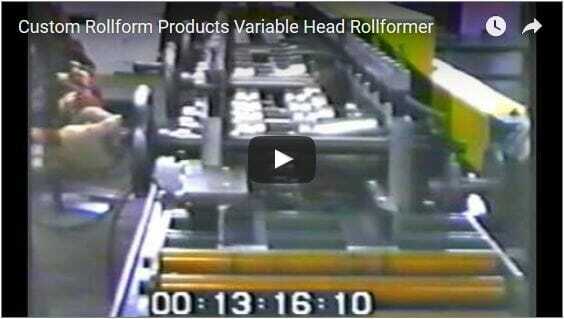 Slitter Heads are automatically positioned based on quantities and width/length variables. Can produce a variety of single blank sizes with no setup and a minimum of scrap loss. 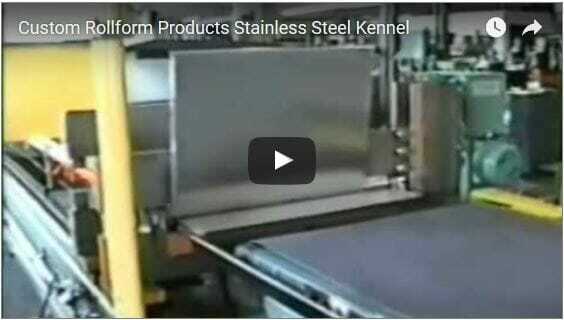 Stainless Steel Kennel using a common coil strip width the System is designed to notch, punch, rollform, and tangent form the 1/2″ radius corners. 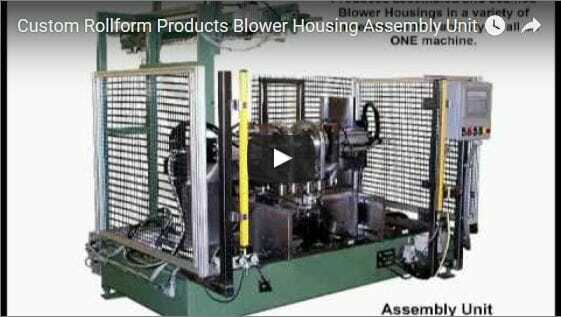 Unit can produce a 48″ x 72″ housing then an 18″ x 18″ with out any setup or changeover. The H.D. 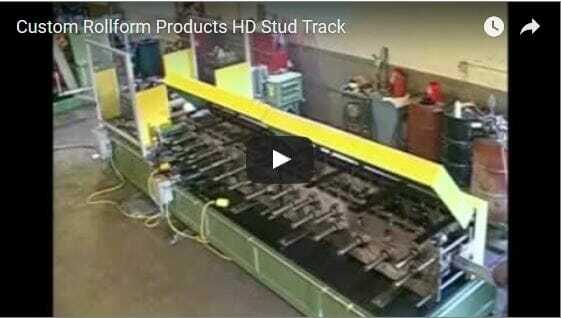 Stud Line was developed by Custom Rollform Products as an Economical System to manufacture Stud and Track on a just-in-time basis. It offers the latest concepts in quick-change setups that allow you to convert from Stud to Track in less than a minute. This allows manufacturers of Pre-fabricated Housings and Major Contractors to produce cut-to-length sections on-time and as needed without hours of setups, coil changes, and excessive scrap loss. 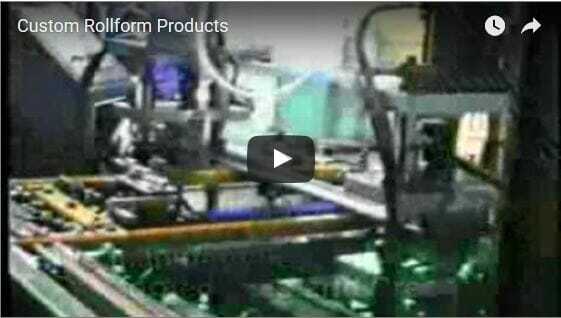 This video shows a variety of Tangent Forming Systems designed and manufactured by Custom Rollform Products. 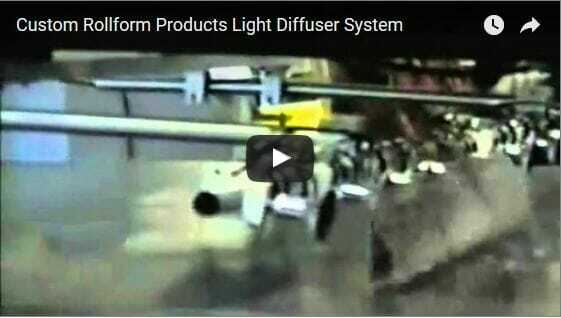 The video includes Inline Systems to manufacture Personal Safes, dog Kennels, Furnace Wrappers, Window Air Conditioners, Electrical Enclosures & Disconnect Boxes, and high polished Florescent Light Diffusers. Our Programmable Rollform & Tangent Former Systems can produce a wide variety of three & four sided Wrappers with a minimum or no setup, changeover, downtime or scrap loss to vary heights, widths & depths. Multiple Inline Hole Punch Press Dies eliminated secondary operations and drastically increased overall production capacity and improved part quality. 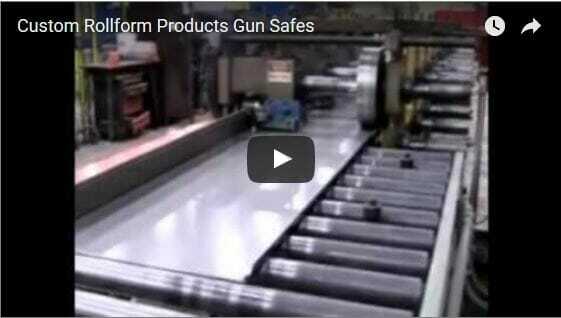 We take pride in the technical designs and concepts we have introduced over the years to increase the productivity and accuracy of our Rollform Systems. We have led the field for over 20 years developing programmable Index Feeds, Multiple Pre-Tooled Rollformers, Variable Width Rollform Tooling and a wide variety of quick-change tooling and setup concepts. 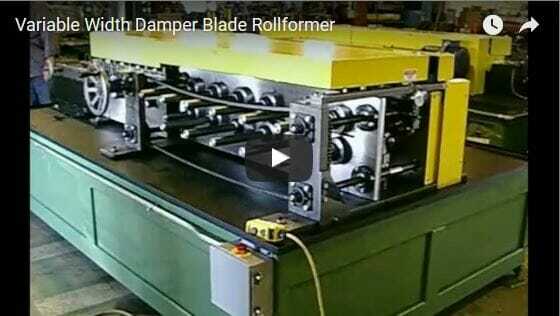 This Free Standing Variable Width Rollform Machine, designed and built by Custom Rollform Products, Inc. in St. Louis, MO, forms Damper Blades from pre-cut strips. Blade width changeovers are accomplished in less than one (1) minute. 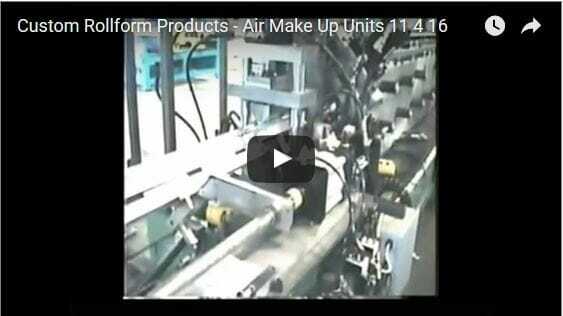 Unit can also be incorporated into a complete Coil Strip Feed and Cut-To-Length System.